My two furry wonders have been with me for almost two months now, filling my world with the joy of their boundless exuberance and, lets face it, sheer irresistible cuteness. I figure it's time that I start sharing the love. Yoda is my bold and brave adventurer. He was eager to start bonding from the first night at home, and is always the first to check out a new toy, or to go "off roading", which is what I call it when they jump off me to run around on the floor. Jabberwinky is much more cautious, and is very vocal in her attempts to convince everyone around that she is a large and fearsome monster. She was very crabby in our first few weeks together, but has since broadened her expressions into a wide range of sounds including adorable little squeaks and puffs, as well and barking, chirping and crabbing at all levels of volume. This morning I went to check on them at the usual time (6:30ish) and found both of them still awake and active in the dark. I put on my red head lamp so that I could see to remove and clean up their kitchen, and of course at least one of them had to storm the gates and escape the cage while I was at it. Today it was Jabberwinky, while Yoda crawled into his pouch early for a change. She ran around on me for a while, before jumping onto the cage and climbing to the top, then climbing on top of the plastic containers I have stored up there, trying to get to the highest point she can. Then she leapt up at the wall... which has no traction at all, and so she just slid down until she turned and grabbed hold of the cage. Then she made a second leap at the smooth wall, this time sliding down to the couch before I scooped her up. Has anybody else tried this idea with high shelves as glider platforms against a wall outside the cage? As for Yoda, he can't stand to be left out of the fun for long. By the time I had wrangled Jabber back into the cage and detached her clinging grip, Yoda was out of the pouch and the cage. He ran around on me for maybe a minute before leaping to the floor to enjoy some off roading. I followed him all around the house at a distance to make sure he didn't get into mischief, waiting for him to come back and run up my leg. When he came back, I managed to capture him while he ran down my arm, and got him into a hammock in the cage before he managed a death-grip with his claws. And so my day begins. My hands are covered in tiny scratches, but my heart is filled with joy. It's a fair trade. You could make a climbing net out of fleece for them and hang it on the wall for them to catch themselves when they jump at the wall. Some people will give them a whole room in their home and fill it will all sorts of stuff hanging from the walls and ceilings. As much as I would love to sleep in, I've discovered that mornings are best for play time - when they're not so ready to "potty" all over me and the house as they are just after waking. And so I wake around 5:30am each day and go downstairs to greet the gliders, where they leap to the cage doors, eager to come out and play. As soon as the door is open, they leap onto me, then onto the floor to run off exploring. Most of the time they stay out of too much mischief, but I have not completely glider-proofed my entire home yet and there are some areas that I was (foolishly) hoping to keep off limits. My tallest piece of furniture is an open-sided metal and glass display rack, where I arranged my collection of polished stone spheres and other items. Of course, the gliders can sense what's breakable and shouldn't be touched - and so that's exactly where they go. Many futile attempts were made to keep them from the case, collecting them with a firm "no" each time they leaped onto it. Finally Yoda broke an item, and I had to surrender to the inevitable... that piece of furniture now belongs to the gliders. I removed all my stones, and started putting glider-friendly stuff on each shelf of the case. Today I'm going to the craft store to buy materials to build a little bridge from the top of the case (almost touching the ceiling) to the top of their cage (ten feet across the room). Yoda is the adventurous one, as always, fearlessly leaping and starting to stretch his "wings". Jabberwinky is acting with her customary caution, preferring to climb up and down me to the ground or the case, rather than leaping. But I think that they'll both love this high bridge that I'm envisioning, and hopefully keep them too occupied to explore other places I'd rather they keep out of. Here's a photo of them checking out a shelf. There isn't much for then to play with there yet, but I'll be adding more as inspiration hits. Those are some very nice looking gliders! I too prefer early AM play, for the same reason, plus easier to get them back to the cage for beddie-bye. 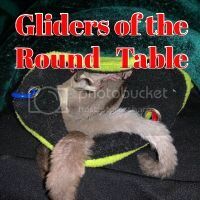 I often dreamed of being able to designate a room for the gliders for play. I used to use my bathroom, but with my living arrangements for the past few years it's not convenient. So we settle mostly for short out-of-cage visits in my bedroom where their cage is. 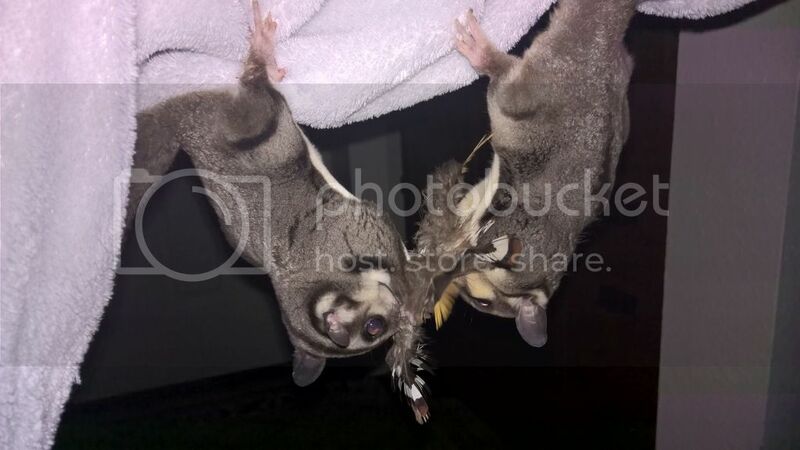 My gliders loved climbing and exploring my space saver, both the one in my bedroom and the one I had in my bathroom. Thanks for sharing your photos! Why is that I just can't get enough of these little critters? The layout of my condo is one big room downstairs (kitchen, dining, living, entry), with my bedroom and bathroom upstairs. I want to keep my bedroom a glider-free zone, so I've avoided letting them go upstairs at all. It would be easier to keep them contained in my very small bathroom, but not much fun for them. Their cage is in the living room, and they love getting out to roam. 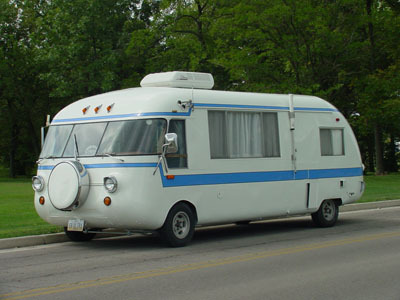 I can see that my best option is to go with it, and just glider-proof the whole space. Otherwise, I have to be vigilant in following them both around (often in opposite directions) to keep them out of trouble. This morning I had plenty of time, and so just let them keep running around until I eventually turned a light on, which was their cue to come back to the cage and snuggle up in their pouch. So much easier than the usual routine of wrestling them into the cage one by one! This morning routine with the gliders is working really well. They've done all their peeing and pooping by the time I let them out of their cage around 5:30-6:00am, so there's no mess as I let them scamper and bounce all over the room. They explore more each day, letting me know what things I need to move or protect, or be ready to surrender them as property of the gliders. They've discovered a large tapestry hanging in the dining room, which they adore. The best part is the two hanging tassels on the bottom corners. Unfortunately, climbing the tapestry leads to an easy leap to the book case where I have my collection of antique teacups (delicate and breakable, naturally) from my grandmother. Those cups will be moving very very soon. They continue enjoying the tall display case that is now theirs exclusively. I did build a little bridge from the case to their cage, and both of them have tested it out a little, but they seem to prefer using me as their main source of transportation from one leap point to another. I left my large (18") drinking horn hanging from the case thinking that they couldn't damage it... not thinking how appealing another cozy hidey hole might be. Yoda now wants to curl up in the horn for a nap. See attachment. My gliders are learning to play fetch, but in their version of the game they are both the ball and the dog. First they leap/climb onto me from the cage. Then they launch themselves off to a point a few yards away, after which they come running back to climb up on me and start all over again. I've been trying to encourage them to leap to me from high places, but they don't seem ready for that yet. We'll just keep practicing "fetch" for now. On the morning of the 24th, Yoda drew first blood. He was playing among my house plants (mini palms) and just about to tip one over, so I tried to gently scoop him up. CHOMP on my thumb and broke the skin for the first time. So I grabbed a fleece blanket, bundled him up and deposited him and the blanket into their cage. OK, lesson learned. Don't use bare hands to remove gliders from plants. Got it. So a couple of days later, Jabberwinky is in the exact same position, about to tip over a plant. Using a fleece, I try to scoop her up. She manages to bite my finger anyway. And since I didn't move my hand away, she continues biting - chomping and chewing - on my bleeding fingertip. (Yeouch!!) This incident was accompanied by loud cursing on my part, leading to Jabber giving me a scared face once I got her back in the cage. After I worked past the resentment of my now very sore finger, I went back to the cage to talk in a soft voice and try to make friends again. Been doing that ever since. I decided that I need to spend more time in physical contact with them during their sleeping hours to re-introduce my hands as friendly. So now a couple of times each day, I put my hand in the pouch while they're sleeping. I cup them, pet them, talk to them, give them a few treats, then leave them to go back to sleep. I feel like we're making a little progress. This morning we were having our usual out-of-cage play time, and Yoda was back among the plants. Very carefully, I used a fleece to encourage him to climb further up the plant until he had nothing but the fleece to climb on, then moved him (in the fleece) over to his favorite chair. Then the sneaky little bugger reached his around the edge of the fleece to give my finger another good chomp, again drawing blood. [censored], Yoda?? After each bite, I have put the offending glider back in the cage and turned on the light to signal the end of play time, getting the other glider back into the cage shortly thereafter. They are now boycotting their usual sleeping/bonding pouch and have curled up together in a tiny "cave" that they've previously ignored in the cage. What has gone wrong here? I felt like we were getting along so well before plantgate. Do I need to remove the plants, stop the morning play time, wear chain mail gloves for handling the gliders...? Any suggestions would be appreciated. It's been just over a week and this biting thing seems to have become a trend. We're still having our morning play time, but most mornings end early with lights on after a bite. By now, I'm feeling anxious. I avoid exposing my hands anywhere near them, wearing a big terry cloth robe with sleeves that cover my hands. They still happily jump to me (including to my covered hands) and from me constantly during play time. And yet Yoda still curled himself into my sleeve to find an exposed finger this morning, and bit me again. That wasn't a response to any action on my part since I was just standing there at the time, but rather Yoda making the first (aggressive) move. During the day, I cuddle their pouch and put my bare hand inside with them for a while. I feed them treats from my fingers with no problems. They come to the front of the cage whenever I'm near and appear happy to see me. It doesn't seem like they're afraid of me, and so I don't understand what is inspiring all these play time bites. It may be their age as well, I am sorry but I don't remember how old they were when you got them. I would continue with your out of cage play and your daytime "pouch time" with them. They should eventually stop that type of biting. My glider still bite from time to time, but for the most part it's a little warning bite that pinches when they don't like something, no blood drawn. My boy Ollie though does tend to be a little nipper and will nip at me for no apparent reason at times. All of mine went through a biting/nipping phase from about four months to seven months. Reminded me of infants who want to sample everything around them with thier mouths. Fingers & earlobes are at the highest risk since they can get thier tiny mouths around them. Even still (14 months old), Merlin goes through bitey phases (often randomly) and Arthur likes to groom me... frequently agressivley. Both have drawn blood (Merlin just last night, the turd). Try not to become afraid. It can hurt, but they can't do any real damage, just something I keep in mind. Tssk or hiss at them when they start, do a sharp "ow" or "stop" if they continue, or (gently) push them away. These are actions (minus the speech, they do short crabs instead) that I've seen my furballs do when they get irritated with each other. Stay strong & consistent, don't let mouthy balls of dryer lint beat you, & realize it will get better if you show them it doesn't bother you. For example, when Merlin bit me yesterday, instead of pulling away I scratched his head then picked him up. sounds like they have drawn A negative association with your hand. Best way to fix that is with some sleep-overs. If they try and bite your hand in the pouch, while attempting the sleep-over, make a tight fist. The FIST is much harder to bite. Don't let them drive you out of the pouch. Yogurt Fist if biting persists. I find my guys are much more tolerant of my hands even after just one session of this. "Huuuh...what? The hand again? It's three in the afternoon! Ahhh, screw it....zzzzzz..."
Thanks for the feedback! It does help to know that everybody goes through this phase at one time or another. I adopted these two on October 14, so I estimate their age to be 4-5 months at this point - right on track for the biting phase that Hutch described. I'm also starting to mix up play time a little. I had been avoiding nighttime play since that always means more bio-cleanup. Yesterday morning I noticed that Yoda peed one drop on me, then went for a long drink of water. Perhaps by denying them the chance to pee on me during early night play time, I interrupted scent-bonding somehow? So I let them out for night play last night, and they both happily peed on me at that time. There was no skin broken during that play time (yay!). We also got through this morning's play time with no blood shed. I don't know. Maybe it's some sort of trade off. If I let them scent-mark me more often, then it's all good. But if not, then they behave more aggressive/defensive towards me. Hmmm... maybe. Something to keep an eye on. The mouthy balls of dryer lint and I will just have to keep getting to know each other better. I haven't had any problems with biting while they're in the pouch. Yoda will nip at my fingertip if I put it in his face, but has never broken skin in that situation. Jabberwinky will give me a little quiet crabbing in the pouch sometimes, but she hasn't lunged at me since our very early days. All three of us are comfortable with my hand in the pouch during sleep time. The hard biting seems limited to our morning play time so far. They do have a nice big cage with lots of fun stuff to explore and play with, but they just get SO EXCITED to come out of the cage. Maybe they get over-stressed from having too much fun gleefully bouncing around like rubber balls...? Morning play time has been less painful over the last few days, and I've been waking them for treats during the day more often as well to associate my hands with good things. It must be working, because both of them curled up in my bra for a few hours the other day. They would have happily stayed longer, but I needed to leave the house and didn't want to go out packing furballs in my cleavage. This morning when I turned on the lights to signal "back to the cage", Jabberwinky went in as usual, but Yoda headed for the drinking horn that he likes to hide in from time to time. I decided to let him chill in the horn while I surfed the web a few feet away. Yeah...potty breaks will be an onging problem. A this point I am just happy to keep the turds out of the coffee. The best thing I have found for less free-range poop...and more in-the-cage poop--is just to not let them out of the cage for the first hour they are up. They have endless poop to go around. Comrade, I use a big travel mug with a sealed lid for my tea. Turd free for every sip. While Jabber slept soundly in the cage all morning yesterday, Yoda was hanging out with me. After curling up in my sleeve, then he crawled up through my fleece jacket, around my torso a few times, then settled down to nap between my shoulder blades (inside the jacket) for a couple more hours. That's the first time we've had significant non-pouch cuddle time! I've never seen him stay awake so late into the morning before, but it was nice to have that time together. This morning I came down for play time about 20 minutes later than usual, and they were excited to come out of the cage as always. I had enough of that, so I gave a firm shake of my hand into the ball pit to dislodge him onto a soft landing and shut the cage door. Then he went wild - racing all over the inside of the cage, even faster and more energetic than usual. He really wanted to be out of the cage! After treating my finger, I went to sit beside the cage while Yoda was still tearing it up inside like some sort of wild animal (*ahem*). I spoke softly to him, tried to make eye contact (as much as one can make contact with someone moving as fast as a glider at top speed), and pressed my hand against the cage for him to smell. He still tried to bite me (sigh). I didn't let him out of the cage because I want to avoid rewarding bad behavior (biting), and because he really was running around like a little maniac and I didn't want to unleash that in my living room. Jabber was sweet as pie. She scampered around the house a little, did some climbing, but generally stayed out of trouble and then curled up to sleep. 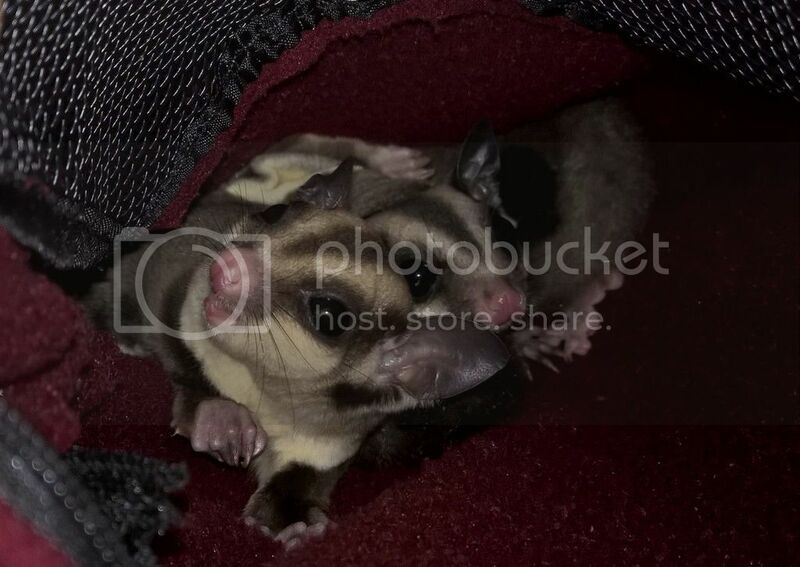 Once they were both settled, I took them out of the cage in their pouch for some snuggle time. They were still awake, and Yoda started sticking his nose out to explore. Again, he went for biting when I offered my knuckles, but stopped when I gave him the "tsk". It was more of a sleepy little "hello" chew this time. It really seems more like a biting phase than an anger/aggression issue, but either way my finger still hurts! Biting issues aside, I really am proud of Yoda for being such a bold and brave little boy. He is such a good leaper and climber! This morning he managed to climb the frame around my front door. First he got up to the door knob and started trying to work the lock. (I'm not kidding!) That wasn't working for him, so he kept climbing all the way to the top of the door jamb so that he could enjoy the view from up there. Many years ago my sister gifted me with an Alaskan Native handcraft, which is this little mask carved out of bone and surrounded by feathers, meant to guard an entrance. It hangs a few inches away from my front door. Bone and feathers? You guessed it. As soon as Yoda spotted that from his perch, he made a flying leap to tackle it. I watched the frenzied ball of fur and feathers for a moment before noticing that Jabberwinky's attention was also captivated from a few feet away. Recognizing that Yoda had claimed a new toy and that I would be a fool to try and pry it away from him now, I invited Jabber to hop onto my arm and escorted her over to join her brother in their blissful destruction of the mask. That is way too cute! Very nice pic! Thanks for fixing the photo, Karen! I'm still figuring out the best way to add a pic to a post. They love feathers, is you get peacock feathers they will chase it just like a cat does.